What Causes Smog Check Failure? Not passing emissions testing? There are several parts of your car or truck exhaust system that could be to blame: catalytic converters, oxygen sensors, mufflers and the exhaust piping in between. We'll repair the problem with your vehicle and get you back on the road, typically in the same day! 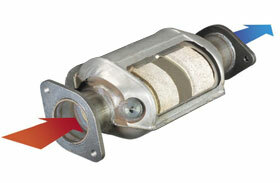 Catalytic converters are filtration elements that remove impurities like carbon monoxide from your vehicles exhaust. When catalytic converters go bad or become clogged, it effects your vehicles performance, fuel mileage and smog emissions levels. We carry a wide variety of OBD1 and OBD2 catalytic converters to accommodate most makes and models of vehicles, both import and domestic. We stock a wide variety of OBD1 and OBD2 catalytic converters to accommodate most makes and models of vehicles, both import and domestic. 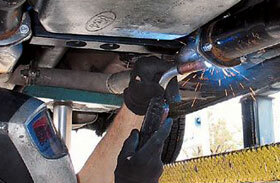 All California vehicles catalytic converters will no longer be based upon gross vehicle weight and engine size. Direct application look-ups below are the only approved method for determining the correct part number for California vehicles. 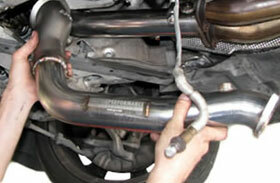 It is illegal in California to select a catalytic converter for installation based solely on vehicle weight, engine size, physical shape, size, flow rate, configuration or pipe diameter. Need Its O2 Sensor Replaced? Oxygen sensors "sniff" your vehicles exhaust and tell your cars computer to adjust based on what they see. We can replace bad O2 sensors as well as repair or weld in new oxygen sensor bungs should your vehicle need them. In addition to replacing oxygen sensors, we can troubleshoot your entire exhaust system from the catalytic converters to the tailpipe to make sure that your vehicle passes smog every time. This review is way overdue. Over a year ago I was having problems with my Mitsubishi Eclipse failing smog just before selling it. They guys here talked me through all the options for a good 30 minutes. They genuinely tried to help me deal with the obstacles before sale. Their honesty and kindness were not forgotten, even a year later. I will be bringing my car there for all future muffler service.